Ok ok, I know my last post was a week ago and this post is going to be very similar to the last one, adding things I omitted last week and new things I have learned since then. I will also talk about club life as I had just joined a club and didn’t know much about it yet, so you’ll get some of that in here as well, enjoy. Club! 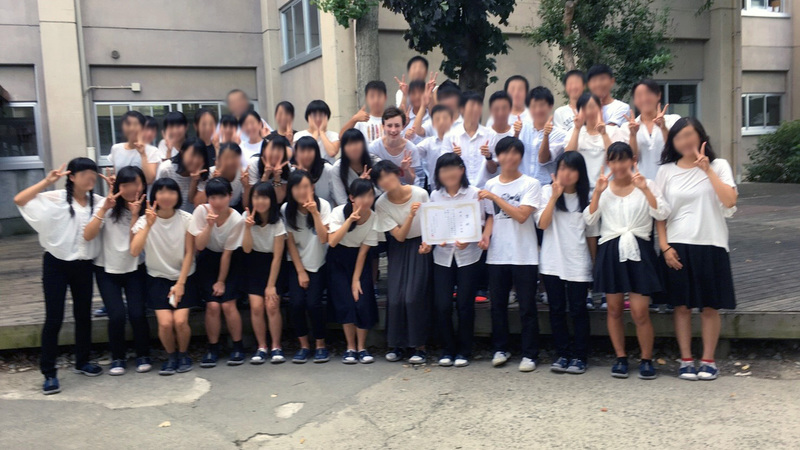 On my first day of school I was asked by almost everybody in my class if I were interested in joining their club, everything from tea ceremony to basketball. Some clubs that I find interesting, although I would not be too interested in joining them myself are tea ceremony [because it’s a lot of sitting], brass band [not to great at music], flower arrangement [something I find very interesting but it seems difficult] and calligraphy, which I would actually be interested in joining, however I have calligraphy lessons [which are my favourite lessons by far], so I decided to join the international club, as: 1) my friends in this club, 2) it’s English debating, 3) we get to travel around Japan for tournaments, and finally 4) even the teachers asked me to join this one, so I didn’t really have a choice. Club is really fun though. Club meets everyday, on schooldays we meet from around 4pm [which is when school ends] until around 6pm [which in actuality turns into 6:30 every time]. On weekends we meet from 9am to 4pm [again, it usually ends later]. Club is a weird mix between a lesson and a fun afternoon spent with friends, as sometimes it is only the one and sometimes it combines in odd ways. Oh, and there are tests… which you often have to study for… you know, in those few hours you have between school and school which are usually reserved for sleep, those are often spent for studying. [note, I haven’t studied for any tests yet, as I have been studying Japanese, but from what I have heard, people don’t sleep much, in health class we were taught that 6 to 7 hours of sleep is best for your health, I haven’t been seeing that in effect yet though]. The debate topic for this year is if Japan should adopt a UBI [universal basic income], which means there are a lot of numbers and tax plans and statistics to study and I spent the first week just catching up on the 100 attack cards and few dozen research papers on the topic. There are 4 team members per group, a constructive speaker who reads the 2 arguments and answers questions, the attack speaker who has to find weaknesses in the opposing teams constructive arguments, the defense speaker who defends against the attacks and the summary speaker who summarizes the entire debate and compare importance and effect etc. while trying to demonstrate how his_her team was better. It all seems very strict and there are a lot of things to prepare for. Also the opposing teams English usually isn’t the best, as I have learned from the many skype debates our Club has had with other schools around the country, which makes understanding, yet alone finding attacks rather difficult. I switch between the attack and summary role depending on which team I am in. Ok, enough on what we do in club, BI probably isn’t what you are here for. See, much better, this will get you to pay attention again. Wait… what? Yona, why did you not take any pictures of your bento to show here? Sorry. My host mother makes the most amazing bento boxes, and I just tend to eat them all up before thinking about talking a picture, also, I find t rather annoying when people take pictures of their food, so I don’t usually take any, if you would like to see some though, leave a comment and I’ll update this post. The bento box usually consists of 2 to 3 different boxes, one box is for rice, one is for veggies, fish and meat or any other super tasty food, and, if there is a 3rd, it is filled with fruits or chocolates… desert! Oishii! Most students in my class bring bentos to school with them, the bento boxes being held together by a colourful cloth, which often has really pretty patterns on it, my bento box is bright green and my host mother uses several different cloths to tie the boxes together, each being prettier than the last. That is something I have noticed about bentos, the colour and arrangement is really important, and all of the bentos from everybody in my class [including mine of course] are really really beautiful. There is also a small stand set up at lunchtime every day that sells bentos, juices, and, most importantly, Papico. I am now officially addicted to Papico… Papico, Papico, Papico. This is something I find really different from how the school system operates in Austria. In Japan, when you get the test results, it will tell you your rank out of all students in your year. Everybody knows who the top students are and the list is hung up somewhere. Also, there is always competition between classes, there was a choir competition [picture above; we got 3rd place! ], in which all classes took part in, and, tomorrow, there will be a “class match”, in which all classes compete in different sports.